Remember that wonderful scene of the country wedding in “Four Weddings and a Funeral”? Well this weekend Mrs. E. and I will be privileged to attend an old friend‘s nuptials to be held at a farm near Luray, Virginia. We’re not really country people and the weather is calling for temperatures around 90ºF (32ºC) which is about six degrees less than it will be here in town, but still rather warmish. And we wouldn’t miss it for the world. Even the prospect of running into Mrs. E.’s former Marine husband and his riduculously attractive wife can’t hold us back. Two things will save me. Gold Bond Body Powder and summer suitings. Two choices inspired by recent posts on The Sartorialist. Or should I go with something more traditional and Southern? Seersucker, two ways: monks or bucks. This entry was posted in Elegantology and tagged "Four Weddings and a Funeral", Khimaira Farm, Luray Virginia, menswear, The Sartorialist, Wedding clothes. Bookmark the permalink. If I were the bride, I would dearly love to see an elegant white linen suit at my wedding. White linen always makes a statement that no one else in the room is probably wearing. I vote for that one. Can a gentleman wear white to a wedding? Mses Post or Manners would have to weigh in. If this is proper, then the linen would be my choice. If not, choice 4 has the second-most lightness and elegance, choice 1 is too business-like to my taste, but choice 3 is also loverly. Count me in. I’m all about the white suit. My vote is for the white linen. 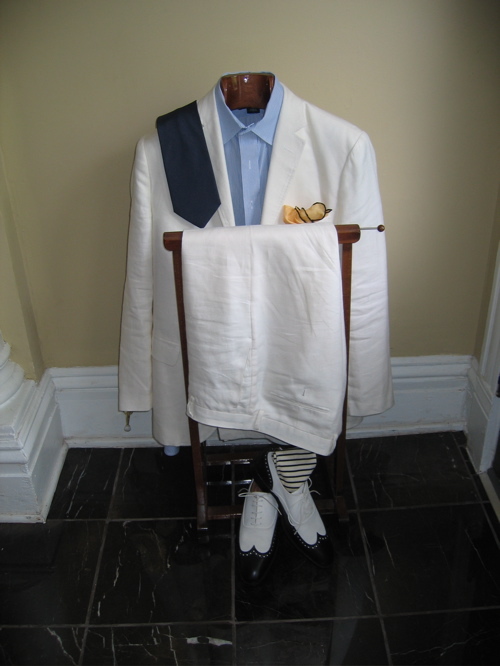 Although I do not think you will be mistaken for the bride, I would find it a little showey for anyone other than the bride – even a male guest – to wear a nearly all white suit (although the white suit is awesome!). I would opt for #1 or #4 (with the lighter tie). If you select #4 I would consider a more colorful tie than the two you have selected. Have fun and enjoy the weekend! I really enjoy your posts. I’d say follow Wedding Guest Rule Number One: If there is any question as the appropriateness of the outfit – don’t wear it. For a wedding, I would suggest letting the bride be the only one in white. Don’t get me wrong, I love white linen suits on men – love them. Personally, I have a weakness for seersucker suits and either option will look great (I can’t decide). I like them all of course but #1 has the vest and it will be 90. 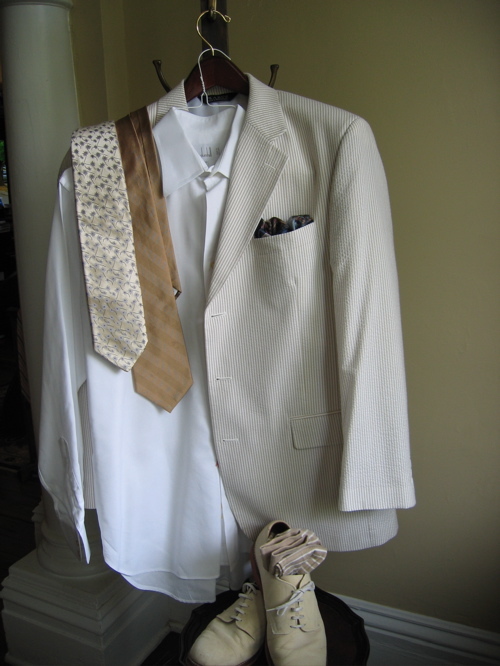 The white linen is probably the coolest by a little too “upstage-y” for a wedding. Now if it were in Natural! Although I like the white linen choice the best, I agree that if, especially for a wedding, there is a question of propriety, don’t wear it. That said, and this is a bit of heresy, I would go with the khaki suit sans vest. I am several generations removed from you, sir, but seersucker never has sat well with me. Whatever you choose, it will of course look great. I may be too late to contribute if unless you and Mrs. E. are going over tomorrow. If not…WHITE LINEN. Hear me on this…WHITE LINEN. Someone else with scant sartorial capabilities will have at least some version of the other “rigs” assembled. The white linen option is the one. On a more somber note…I just posted a reply over on my blog to your comment and thought I’d leave it here as well…. Elegant…Hate to tell you this my man but Au Pied has been closed for five years. Rykken from Flusser and I had dinner last night and walked a good part of Wisconsin Ave lamenting the old days. He went on and on about the Britches days and all of the old spots in G’town from those days. Local uniqueness and elegance is fleeting. Richmond probably still holds a good bit of it. When one sees a Kentucky Fried Chicken in Picadilly Circus-London, it’s all over! It’s getting late. What did you choose? Make sure to share photos. More importantly, what is your lovely wife wearing? I am sure that, the bride and groom notwithstanding, you will the best dressed and most “elegant” couple there. Have fun! I think I am in agreement with pretty much everyone else here. White Linen. I’ve been to Luray and white linen is too Palm Beach, although I agree nobody but the bride should wear white. Period. Lovely suit though. I’d go with seersucker and bucks. You are a city man after all! Technically, we can’t make this urgent decision until we know the time of day for the wedding–Peter Post , in his ‘Essential Manners for Men,’ says the only time not to wear a navy blazer or dark jacket is at a formal daytime or evening wedding. But he doesn’t really rule out other options for the informal daytime wedding. I think his comments are aimed at men with fewer options. I like choice #3. But you may be packed by now, and it will all work out because they are all handsome choices. More important than the suit is this imperative advice, also from Peter Post–Dance!! Hello All and thank you for your votes and enthusiasm. Especially you first timers — welcome! For those keeping tally, white linen edged out seersucker by one vote. Although several of you were undecided between two choices. I should have mentioned that this is a 5 PM wedding and that there is not specific injunction against men wearing white to a wedding that I know of. Mr. Storey of “History of Men’s Fashion” concurs. Having said that and having slept on the options, I agree that whilst the white linen is by far the more glamourous and elegant choice, it is not my day but the bride and groom’s. 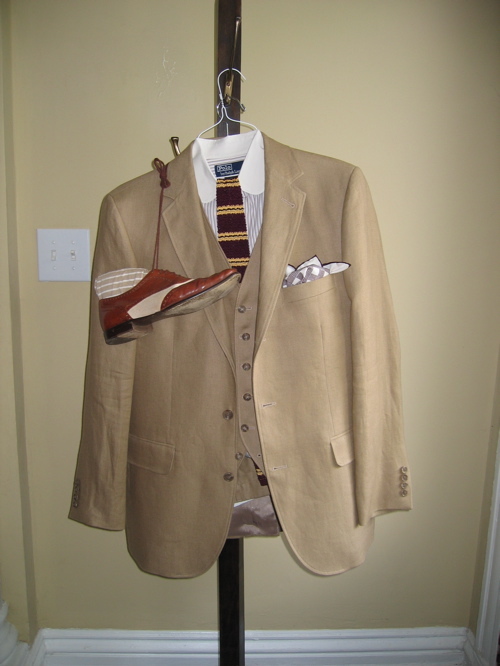 I may go with khaki w/o vest, white shirt striped navy and cream silk knit tie, white bucks (although my spectators are better dancing shoes.) Or the seersucker (which isn’t tailored as well as it is several years older and it does read white from ten feet out….) I have two hours left to pack. Photos next week! Seersucker, pink tie, bucks. Khaki suit would be nice without vest (too hot, and too costume drama), and a lighter tie such as the pink one. Great choices and combinations. I tend to like the tan with brown look for late summer when fall is on the horizon. Hope you had a great time! Khaki linen is it! No vest needed. You will look great! It would be fun to know what the Mrs. is wearing! I really love that white linen! I’d go with option 4. Ditto what Turling said. Brilliant combo. I cannot tell you how I hope it is the seersucker and pink. I was just at a wedding last night, not one stitch of seersucker or originality… do it. Please. Relieve my agony! Hate to disappoint, there were two seersucker suits and a jacket at the wedding. 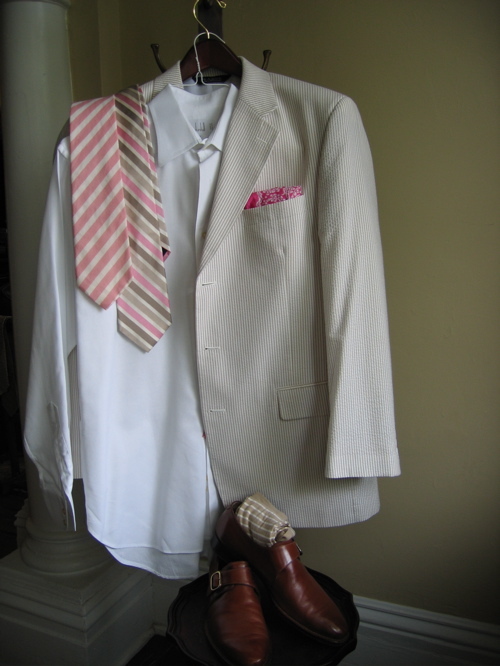 I went with the khaki linen, white shirt, pink/tan/white tie and white bucks. And I was one of only three men (groom, best man, me) who kept his jacket on for the entire evening. In all fairness I should mention that the seersucker just didn’t fit as well. It was the first choice. Second outfit is my favourite! Having said that I’d kill for this striped knitted tie! !